← Happy National PB&J Day from CollectingCandy.com!! Top-Ten Weirdest Flavors of Candies You Love! 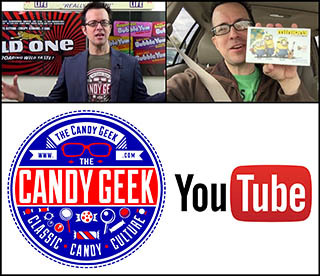 Today we’re going to look at some of the weirdest and most unexpected flavors and brand extensions from classic candies you know and love. These are some of my favorite things to track down and uncover in the world of candy, and I know you’re going to enjoy seeing them. Make the jump to check them out! 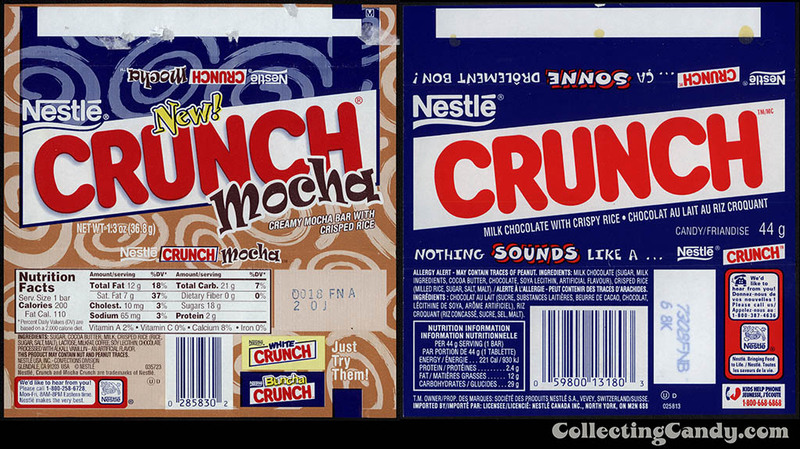 Back in the early 2000’s, Nestle took a crack at grabbing some of that coffee craze by releasing a Mocha-flavored Nestle Crunch bar. I never tried one but I’ll bet it was pretty tasty. In spite of that, this one ended up becoming a limited edition. 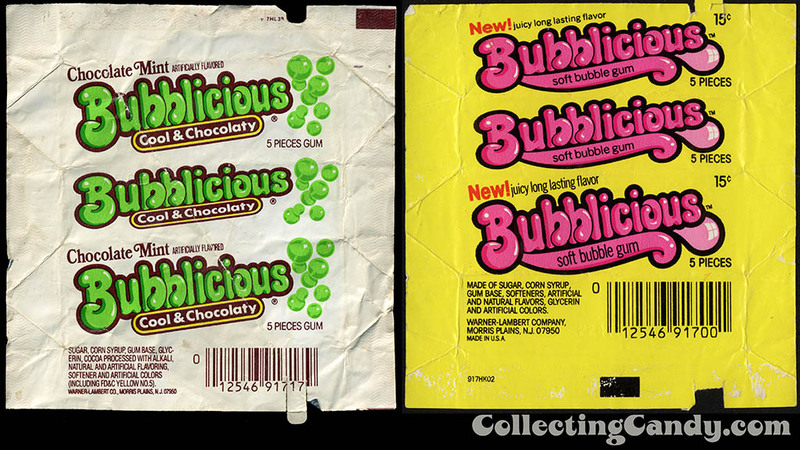 The 1970’s and 1980’s saw the soft chunk bubblegum category explode, and in order to feed that growing market, manufacturers sought to come up with new innovative and appealing flavors. One of the oddest-yet-somehow-endearing has to have been Chocolate Mint Bubblicious. Described as “cool and chocolaty”, this one struck a chord and stuck around long enough to taste the 1990’s before finally retiring. It’s a discontinued bubblegum flavor I get pretty regular e-mails about. The people who loved it still miss it. Good and Plenty is another classic confection that tried some new things back in the early 1970’s. Though their Good and Fruity brand extension survives even today, Good ‘n Minty was gone in a flash. 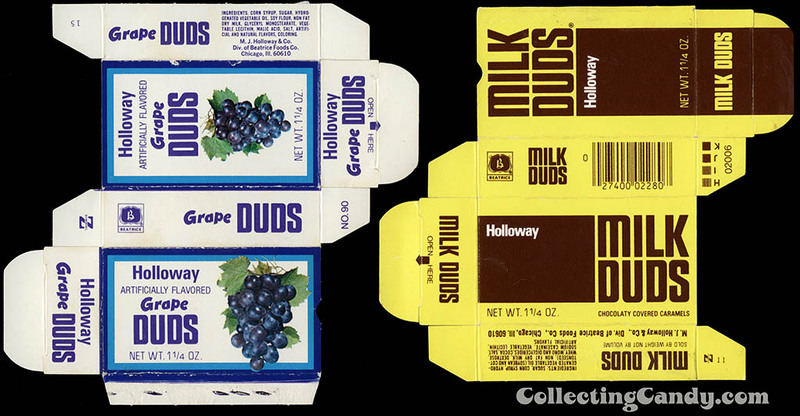 I’ve long been obsessed with the fruit-flavored versions of Milk Duds that were released through the 1970’s and I’ve written quite a lot on them, too. A wonderfully-unexpected brand extension from Milk Duds, these were around for a number of years though the precise variety of fruit-flavored Duds produced remains a mystery. Skittles in mint flavors received a standard release in the early 2000’s but only down under in the Australian and New Zealand markets. Though a mini version of a mint-flavored Skittles were released in North America later, they were sold in hard plastic containers and were more mint than mint-flavored Skittle. The classic chocolate-and-caramel treat Rolo actually got a mint-flavored version in the late 70’s over in Germany. Quite a departure from the sweet standard, these never made it to North America. 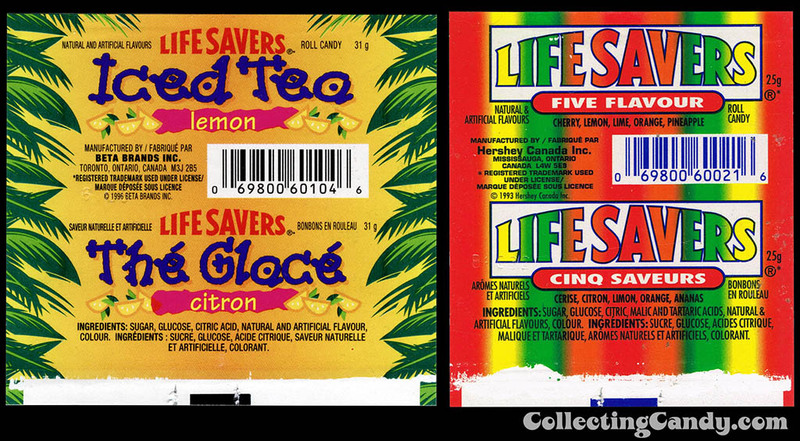 Released exclusively for the Canadian market in the 1990’s, Life Savers in Iced Tea flavors was one of many delightfully-unusual flavor extensions that Life Savers Canada produced. No longer in production, I’d love to see this one make a comeback someday. A tie for the third spot: Released in the 1960’s as part of a “carnival flavors” Life Savers assortment, Crunchy Peanuts is easily the most unusual flavor that came out it. 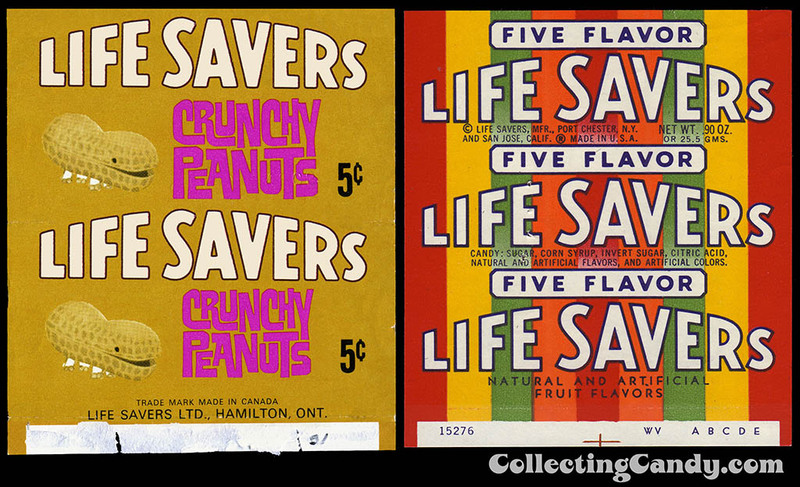 Other Life Savers carnival flavors included Cotton Candy, Pink Lemonade and Candied Apple. 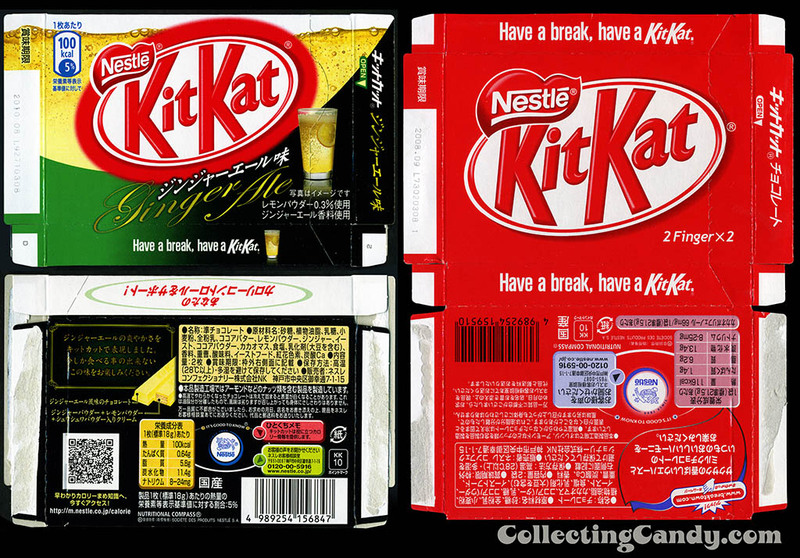 For those that aren’t aware, Japan gets numerous unusual flavors of Kit Kats every year that no one else in the world ever sees. Ginger Ale is easily one of the most unusual – and from personal experience it was also the most unexpectedly delicious. In the early 2000’s, the Just Born company went on a wildly creative run with their Mike and Ike “Featured Flavors” series. The weirdest had to be their Mike and Ike Buttered Popcorn flavor. It didn’t capture the taste buds of consumers and was one of the featured flavor releases that no one seems to wish for the return of. But give props to Just Born for pushing the envelope with this amazingly weird flavor of a candy classic. 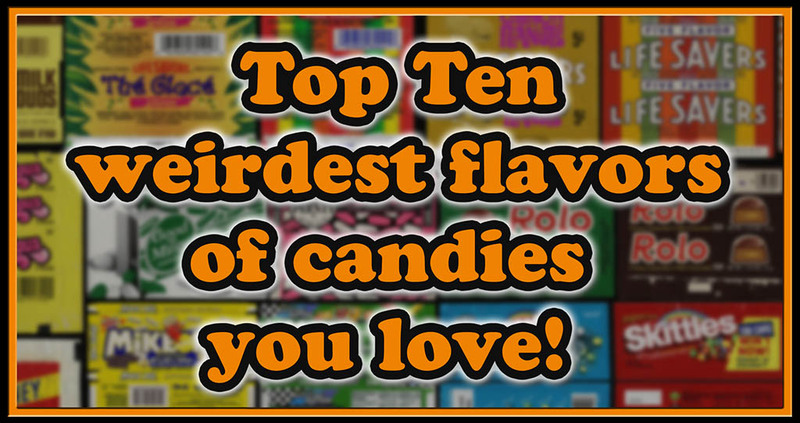 That’s everything for our Top-Ten Weirdest Flavors of Candies You Love list – hope you liked it! If you did, let us know and maybe we will work up some other fun Top-10 lists for the site! This entry was posted in 1960's, 1970's, 1980's, 1990's, Boxed, Bubble Gum, Canadian, Chocolate, Gum, Hershey, Japanese, Lists, Nestle and tagged candy collecting, candy collection, candy collector, candy wrapper collection, candy wrapper collector, collectible, collecting candy, confectionery, confections, packaging, sweets, vintage candy wrapper, wrapper. Bookmark the permalink. 9 Responses to Top-Ten Weirdest Flavors of Candies You Love! I definitely remember Bit-O-Chocolate, and actually liked it over Bit-O-Honey. I remember it had the same texture as Honey, and for whatever reason, I think they might have used the same recipe but just added chocolate. I remember having a Crunch Mocha. It was fine; just like a normal crunch but with a kick of coffee flavor. Now Grape Duds, that’s what I want to try! Why in the world are the Lifesavers Crunchy Peanuts called CRUNCHY Peanuts? Is the flavor somehow different from, say, SMOOTH peanuts? Maybe they were worried that people would assume they taste like boiled peanuts. Iced Tea with Lemon Lifesavers sound delicious. I wish I could try Good n’ Minty. The Mint Skittles were test marketed in the US in the full-size version, in Minnesota. They were mostly decent, though one was so strongly menthol it was unpleasantly like a Skittles cough drop. My father really likes the Köstritzer beer and marzipan version of Halloren balls. Halloren is a German chocolate maker famous for its cream-and-cocoa Halloren balls. In recent years they have brought out an amazing array of (mostly tasty) flavours, but IMO the beer chocolates take the cake. Since many people are curious about them, I’ve send the Halloren Köstritzer to a number of people on reddits’s snackexchange subreddit. Are you active there? t_maia: No, I’m not active on Reddit’s snackexchange, but I will definitely check it out. Thanks for the tip!